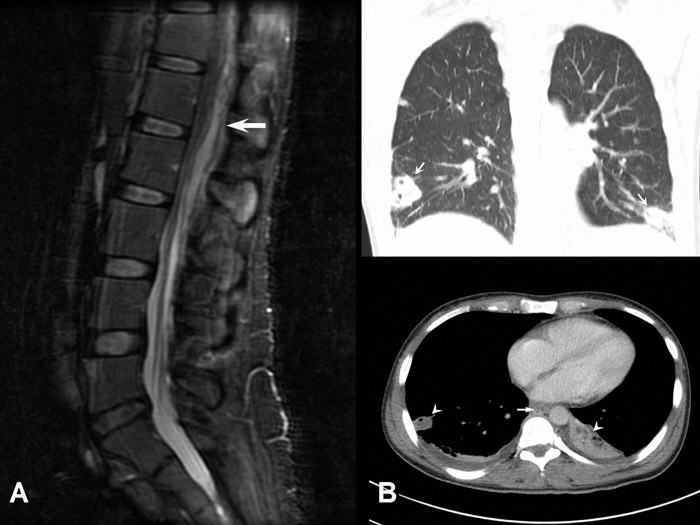 A 32‐year‐old woman presented with a 2‐day history of progressively worsening back pain followed by weakness and numbness in both lower extremities. Her social history was significant for long history of IV heroin abuse. On examination, vital signs were stable. There was tenderness to palpation over the lumbosacral and thoracic spine. Strength was grade 4/5 in the lower extremities. Also noted brisk both knee reflexes. Blood workup showed WBC of 19 × 103 cells/mm3 with bandemia (20%). ESR was 101 mm/hour, and CRP was 121 mg/L. She was started on IV vancomycin and piperacillin/tazobactam. Urgent MRI of thoracolumbar and thoracic spine was done and showed a dorsally located epidural abscess extending from L4 up to T7 (Figure 1). She underwent emergent decompression surgery (laminectomy). Blood and abscess cultures yielded methicillin‐resistant S. aureus (MRSA). On the third postoperative day, patient suddenly developed sudden onset cough, shortness of breath and bilateral pleuritic chest pain. CT scan of the chest showed multiple cavitary lung lesions consistent with septic pulmonary emboli. A filling defect was noted in the azygos vein consistent with venous thrombosis (figure 2). Venous duplex ultrasound of lower extremities did not reveal any evidence of deep venous thrombosis. TEE revealed no vegetations. The diagnosis of septic deep vein thrombosis involving the azygos vein with secondary septic pulmonary emboli was made. Vancomycin was continued and later rifampin was added to her management. There was no anticoagulation therapy was considered. Patient continued on the antibiotic therapy for additional 8 weeks, and she has been well since. Septic azygos vein thrombosis is rare and potentially life‐threatening condition. Early diagnosis is a key to improve patient outcomes. The triad of an active extrapulmonary source of infection, an adjacent venous thrombosis, and septic pulmonary emboli has been recently described in the literature, typically in the setting of deep soft‐tissue infection, bone and vertebral infections. The most common causative organism is staphylococcus aureus which has a tendency to promote venous thrombosis related to its intrinsic thrombogenic and proinflammatory potential. Principles of treatment for this condition include prompt empiric administration of intravenous antibiotics and considering surgical intervention to remove purulent collections. Anticoagulation is the cornerstone of treatment for deep venous thrombosis, its use becomes controversial when the patient presents with septic venous thrombosis. A particular high index of suspicion of azygos vein septic thrombosis is required in individuals how present with epidural or vertebral spine infection complicated by septic pulmonary embolism. Furthermore, the manifestations of infections in these locations (erythema, pain, and swelling) can easily overlap those of septic deep vein thrombosis. MRI of the lumbosacral spine and lower thoracic spine (A, sagittal view): complex posterior epidural collection extending from lumbar L4 level cephalad into lower thoracic spine–associated central canal compromise and findings consistent with epidural abscess. Computed tomography of the chest (B, top; coronal view–lung window): multiple pulmonary cavitary lung lesions due to septic pulmonary emboli (arrows). Lower, axial view–mediastinal window showing multiple cavitary lung lesions due to septic pulmonary emboli (arrow heads). Filling defect is noted in the azygos vein (arrow) suggestive of venous thrombus. There is associated mild pleural effusion bilaterally. Shaheen K, Pradhan G, Muoneke M, Altaqi B. Another Source of Pulmonary Septic Emboli — Azygos Vein Septic Thrombosis. Abstract published at Hospital Medicine 2013, May 16-19, National Harbor, Md. Abstract 391. Journal of Hospital Medicine. 2013; 8 (suppl 2). https://www.shmabstracts.com/abstract/another-source-of-pulmonary-septic-emboli-azygos-vein-septic-thrombosis/. Accessed April 25, 2019.